I can understand the differences between the North and South during the Antebellum U.S. 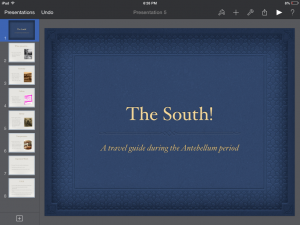 In Social Studies we had to choose a project to do to comparison of the North and the South during the Antebellum U.S. and I chose to make a travel brochure in Keynote. By using Keynote I was able to make it look cool by having transitions between the slides and having the ability to insert pictures. In the app you can also change the style of the text (make it have bullet points, be bold, have italics, etc…) and choose a theme. This entry was posted in My Learning Story and tagged Keynote, presentations, repurposing, Social Studies by msmarcotte. Bookmark the permalink.